PURPOSE: To investigate the effect of ice slurry ingestion on thermoregulatory responses and submaximal running time in the heat. METHODS: On two separate occasions, in a counterbalanced order, 10 males ingested 7.5 g.kg-1 of either ice slurry (-1°C) or cold water (4°C) before running to exhaustion at their first ventilatory threshold in a hot environment (34.0°C ± 0.2°C, 54.9% ± 5.9% relative humidity). Rectal and skin temperatures, HR, sweating rate, and ratings of thermal sensation and perceived exertion were measured. RESULTS: Running time was longer (P = 0.001) after ice slurry (50.2 ± 8.5 min) versus cold water (40.7 ± 7.2 min) ingestion. Before running, rectal temperature dropped 0.66°C ± 0.14°C after ice slurry ingestion compared with 0.25°C ± 0.09°C (P = 0.001) with cold water and remained lower for the first 30 min of exercise. At exhaustion, however, rectal temperature was higher (P = 0.001) with ice slurry (39.36°C ± 0.41°C) versus cold water ingestion (39.05°C ± 0.37°C). During exercise, mean skin temperature was similar between conditions (P = 0.992), as was HR (P = 0.122) and sweat rate (P = 0.242). After ice slurry ingestion, subjects stored more heat during exercise (100.10 ± 25.00 vs 78.93 ± 20.52 W.m-2, P = 0.005), and mean ratings of thermal sensation (P = 0.001) and perceived exertion (P = 0.022) were lower. CONCLUSIONS: Compared with cold water, ice slurry ingestion lowered preexercise rectal temperature, increased submaximal endurance running time in the heat (+19% ± 6%), and allowed rectal temperature to become higher at exhaustion. 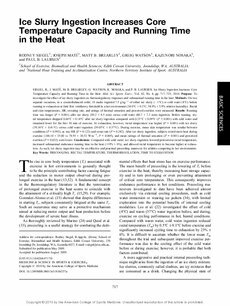 As such, ice slurry ingestion may be an effective and practical precooling maneuver for athletes competing in hot environments.